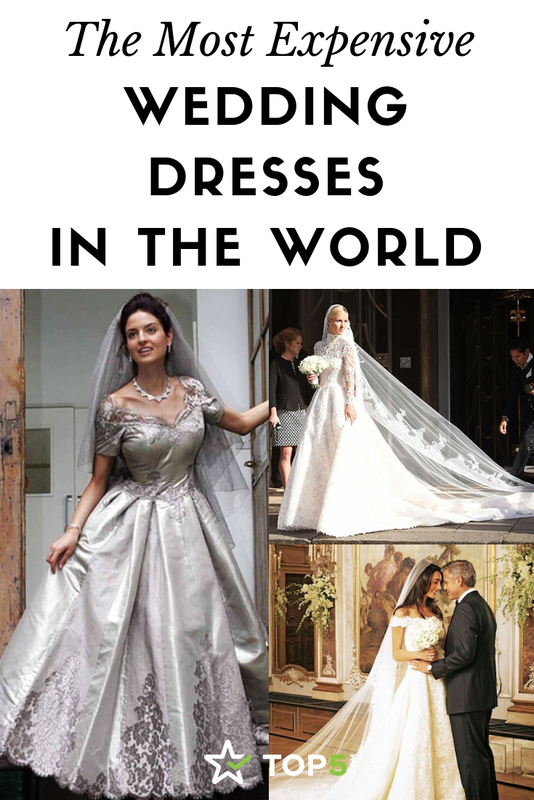 Ever wondered about the most expensive wedding dresses in the world? If so, then today’s your lucky day. 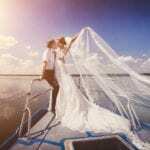 We’ve put together a list of the most expensive wedding dresses ever, from the (relatively) lowest to the most expensive, ranging from tens of thousands to millions of dollars. 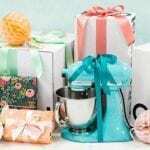 You won’t believe your eyes or the price tags. Katie wore a simple, elegant, off-the-shoulder dress featuring ivory silk and embellished with Valenciennes lace and Swarovski crystals. Taking 350 hours to make, this expensive wedding dress was classic and timeless. On May 7, 2004, actress and writer Tori Spelling married Charlie Shanian. Her Badgley Mischka dress was made up of netting combined with intricate white flowers. Nicky Hilton wore a custom lace-embroidered Valentino gown when she wed James Rothschild in July 2015. The dress was designed by creative directors Maria Grazia Chiuri and Pierpaolo Piccioli and featured three shades of ivory and silver guipure lace and hand-embroidered crystals. 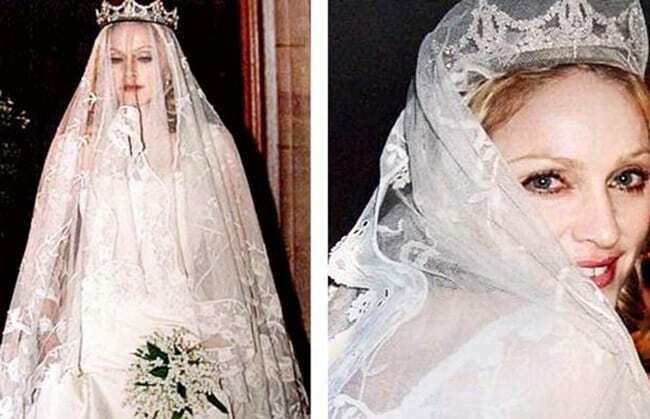 The exact details of Madonna’s wedding to Guy Richie at Skibo Castle in the Scottish Highlands were surrounded by secrecy, and all involved had to sign confidentiality agreements. However, we do know that on the day Madonna wore a Gothic-style Stella McCartney dress and Guy wore a kilt in Hunting Mackintosh tartan. 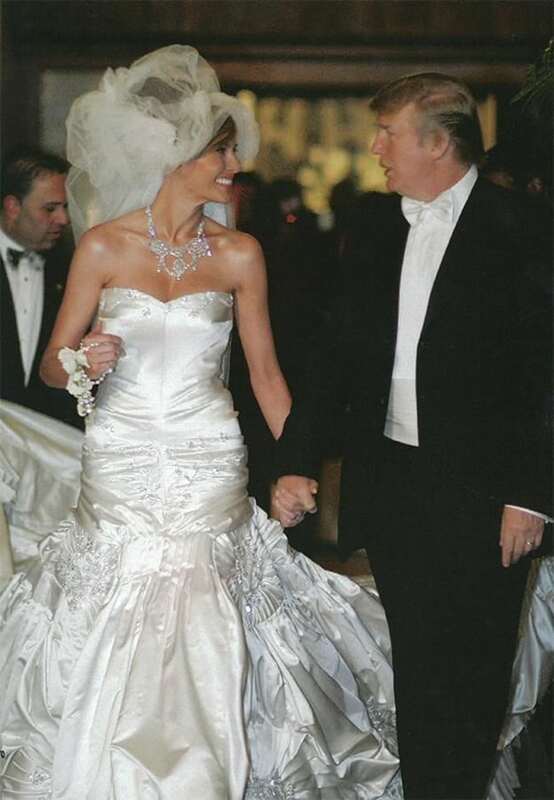 Businesswoman and former model Melania Trump married now-President Donald Trump in 2005. 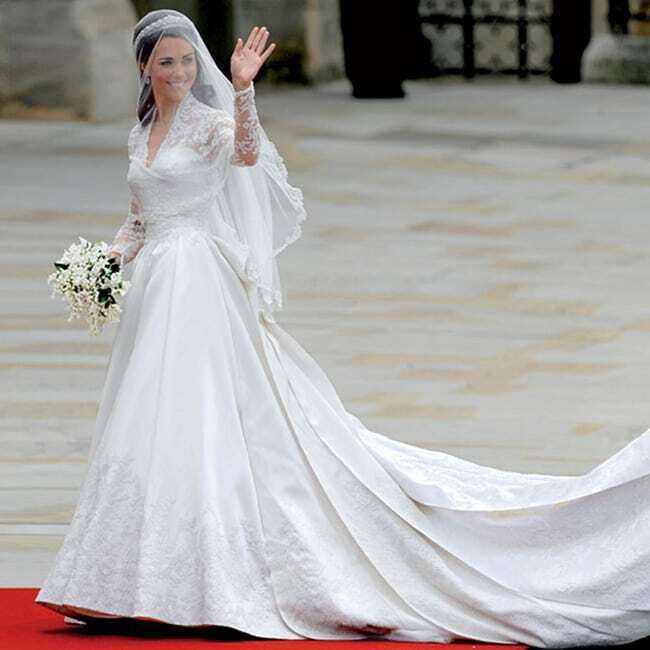 The sleeveless dress was made up of 300 feet of white duchess satin and embroidered with 1,500 rhinestones and pearls. 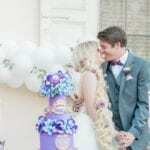 She topped off this expensive wedding dress with a 16-foot veil. Jessica Biel and Justin Timberlake tied the knot on October 19, 2012. Her choice of a pink dress did cause some controversy, but Jessica stated that an all-white wedding dress just wasn’t for her. The dress also had her husband’s nameembroidered on it. How romantic! Back in 1999, Victoria Adams married David Beckham in this timeless and elegant Vera Wang wedding gown. 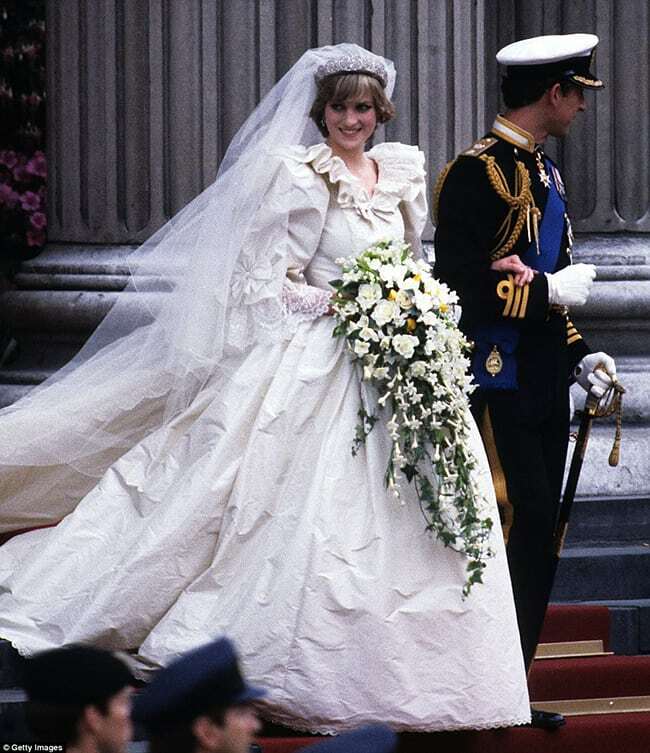 It tells you how much this dress cost, given that it was made almost 20 years ago and yet it’s still on today’s lists of most expensive wedding dresses. When Princess Diana married Prince Charles back on July 29, 1981, it was watched by a global TV audience of over 750 million. The dress was made from ivory silk and antique lace and featured a whopping 25-foot train. The puff sleeves on the dress are so ’80s! Still, this classic is typically on lists of the best royal wedding dresses. Elizabeth Taylor was famous for her numerous marriages as well as her career. 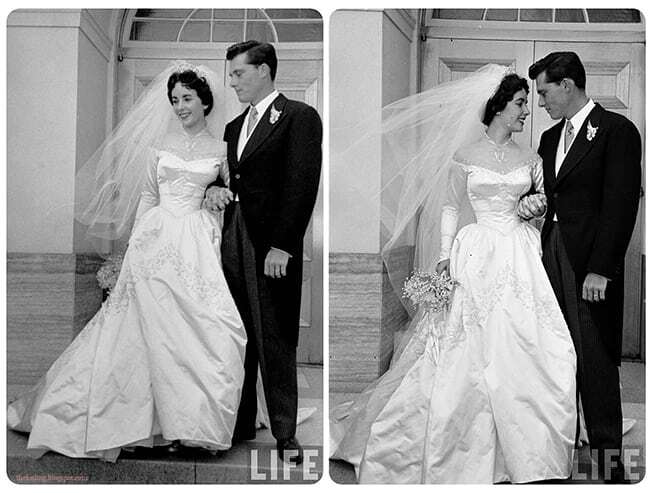 On May 16, 1950, Elizabeth married Conrad “Nicky” Hilton, Paris Hilton’s great uncle, in a Helen Rose gown. Helen Rose designed gowns for the likes of Grace Kelly, among others. The wedding dress she designed for Elizabeth was just stunning. 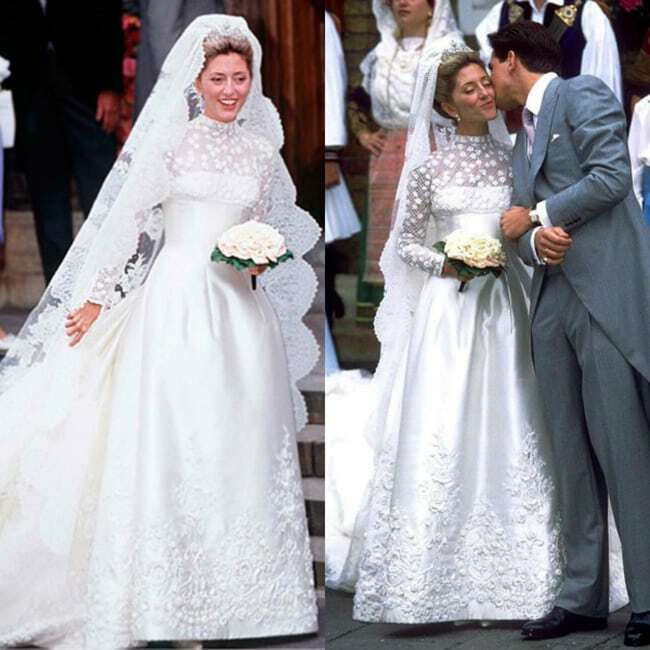 In 1995, Marie-Chantal Miller married Pavlos, Crown Prince of Greece. Her beautiful Valentino wedding dress was the talk of the town, and no wonder, as it has a rather large price tag of $225,000. The dress is made up of 25 different kinds of lace and took 25 people over four months to make. 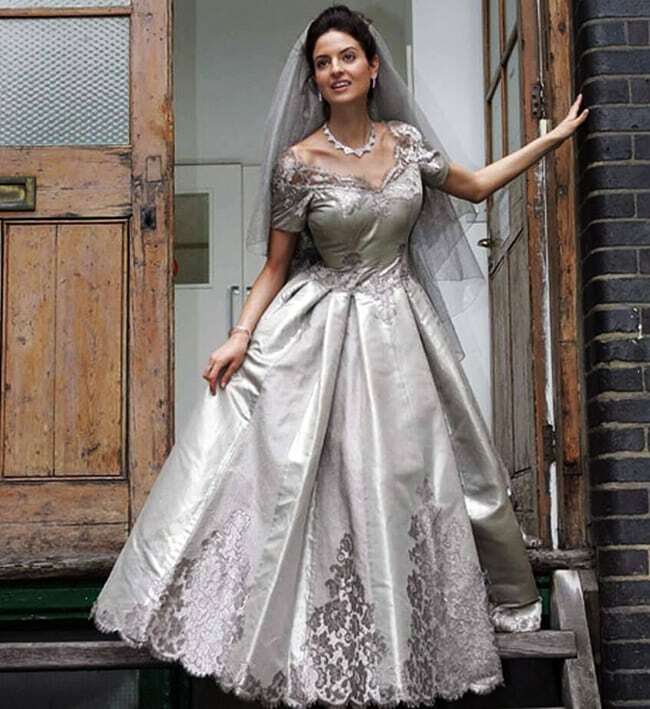 In 2008 designer Mauro Adami created this amazing platinum wedding dress. The dress is made up of 40 meters of silk fabric, featuring platinum threads and beautiful embroidered details. 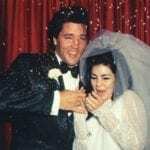 At well over a quarter million dollars, it’s definitely earned its place among the most expensive wedding dresses. Hearts all over the world broke when human right barrister Amal Alamuddin married Oscar-winning actor George Clooney. Her off-the-shoulder gown was created using French lace with diamante details, hand-embroidered pears and an elegant, sweeping train. Kate Middleton married Prince William on April 29, 2011. The blushing bride wore a sophisticated, long-sleeved Alexander McQueen wedding dress. Featuring a fitted bodice and a sheer lace neckline, the dress was most definitely fit for a princess. 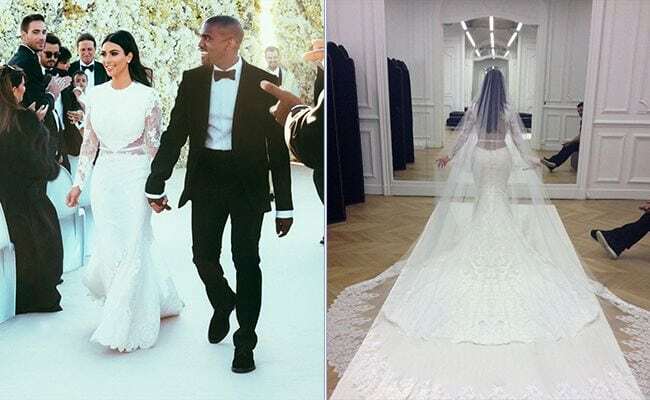 Wearing a Givenchy haute couture wedding dress, Kim Kardashian wed Kayne West. The lacy dress featured sheer waist panels, long sleeves and a long, full veil. Heir to the Swarovski empire, Victoria Swarovski married property investor Werner Murz and it was a sparkling affair. Her custom-made Michael Cinco dress weighed an impressive 46kg and, of course, featured 5000,000 Swarovski crystals alongside paillette and laser-cut flowers. This expensive wedding dress was worth $1 million! 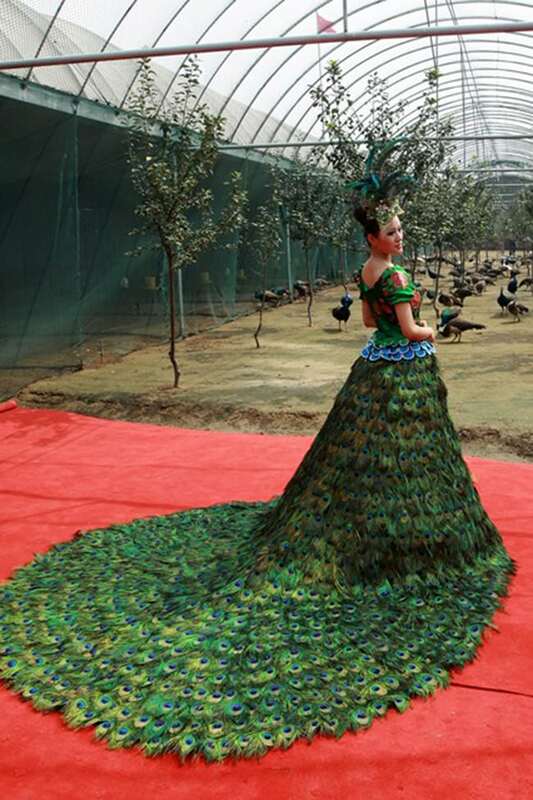 Peacock feathers are thought to be bad luck in some cultures, so this wedding dress may not be the best choice for your big day, depending on where you live—not to mention it comes with a heavy price tag of a cool $1.2 million. And as the feathers are real, not imitation, it would have taken over 10 peacocks to make this green and blue creation. This dress was revealed back in 2010 at Miami International Fashion Week. This lavish gown portrays elegance and sophistication and is a complete bargain (lol) at just $1.5 million. Angelababy married one of China’s leading actors, Huang Xiaoming, at Shanghai’s Exhibition Center. 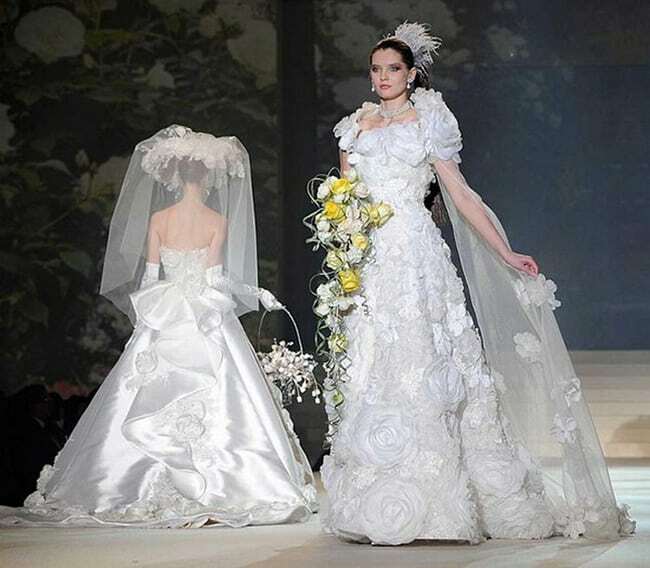 The wedding is said to have set them back $20 million, and although the price tag for this lavish Dior wedding dress is unknown, it’s thought to be in the millions. Designer Yumi Katsura only made two of these extravagant gowns. The dress wasn’t made for anyone in particular, so if you have a spare$8.5 million, then this could be the dress for you. This diamond dress by Renee Strauss is at the top of the list for the most expensive wedding dresses. It was designed so that when the bride moves, the crystals and pearls glisten and sparkle as they catch the light. Do you think it’s worth the $12 million price tag? 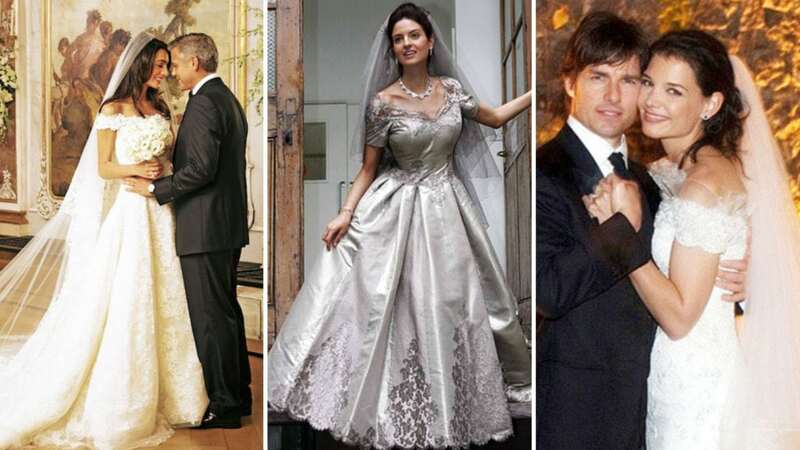 Which of these most expensive wedding dresses is your favorite? 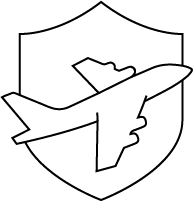 Let us know on social media. Just tag @topfivecom and use #top5epensiveweddingdresses.